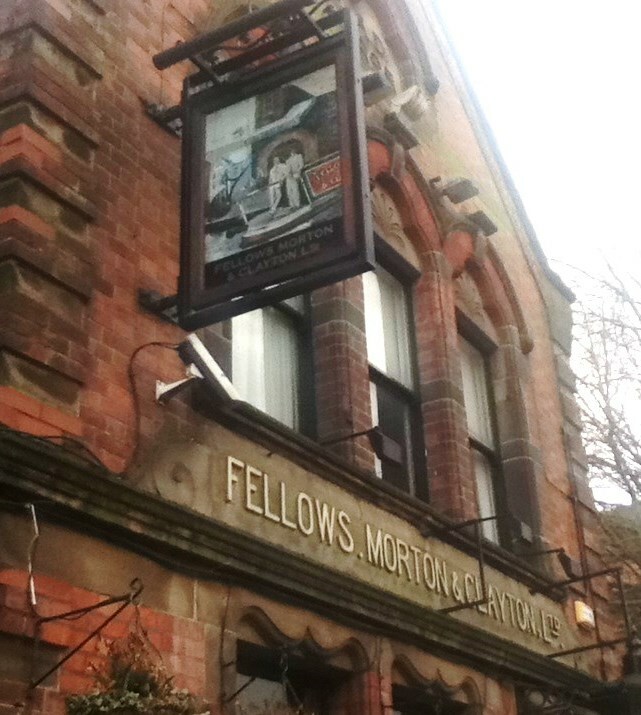 Fellows, Morton and Clayton is a Victorian Pub that lies alongside the canal on Canal Street in Nottingham. The name is derived from a partnership of three men who ran a canal transportation company and a fleet of canal boats in England between 1889 and 1947. It started with James Fellows in 1837 transporting goods by canal between London and Birmingham. In 1876 Frederick Morton bought into the company and then in 1888 William Clayton joined into the partnership, the company then being named Fellows, Morton & Clayton Ltd. In 1895, new offices, stables and warehouses were opened in Nottingham on Canal Street and that is the area in which the current public house now operates. It is what I would describe as a proper pub. 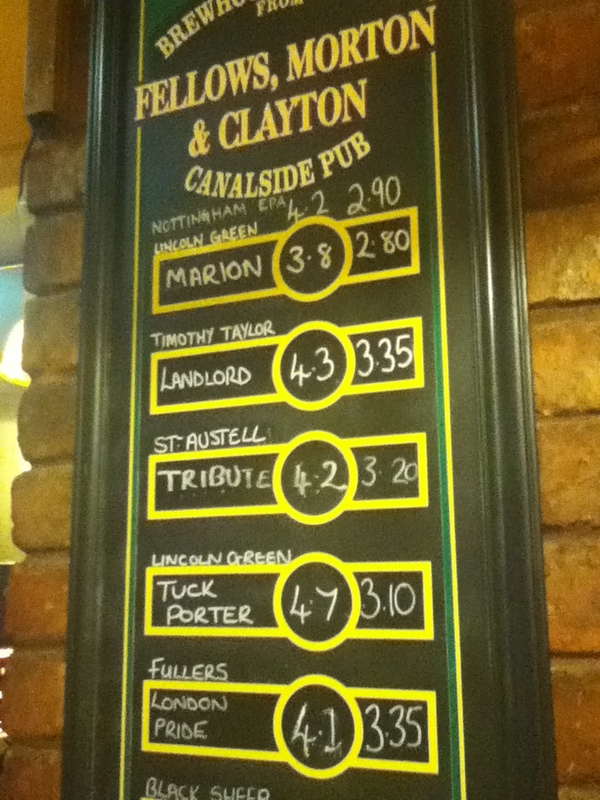 It serves good, well kept beers and good wholesome home cooked food. I was perusing their website and was tickled to read the statement’; “Food – The Art of Eating Well.” and the prose “…our food is home cooked by which we mean it is cooked on the premises. We don’t buy it in ready prepared and heat it up in a microwave.” I like to think that is a little dig at all those chain pubs that churn out platefuls of identical basic lazy food. They go even further on the home page to note that “Our chefs cook the food, they are not microwave operators.” I love it. 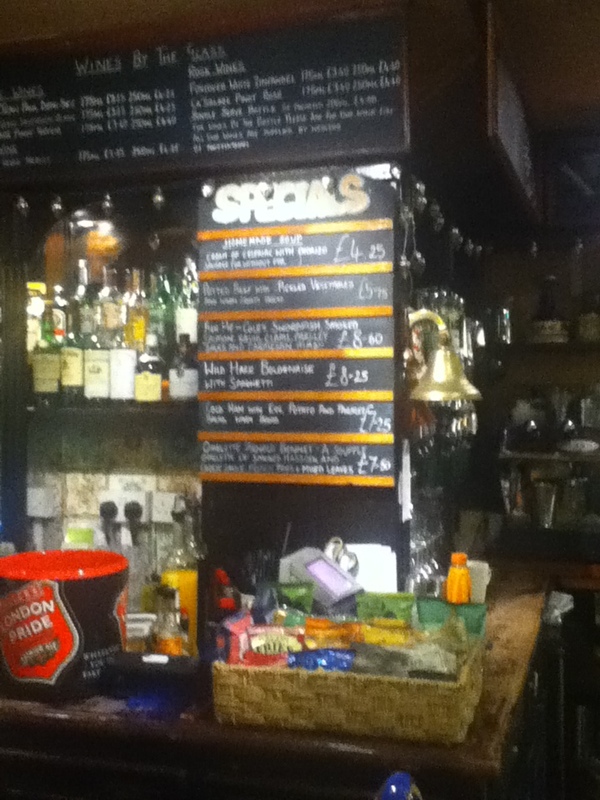 Anyhow I had not read any of that before I walked in on Friday evening looking for something to eat and drink. Over the last few weeks I had seen various interesting meals listed on their specials chalkboard including items like Hare, Rabbit, Pork Belly, Heart, and Faggots to name just a couple of the less common menu items. So I was hoping for something to tickle my fancy. As it happens I was in for some really good luck, opening the menu I saw that they had a pulled pork sandwich. This is one of those dishes I loved getting my hands on in the States and that I have hardly ever seen any in England so that was without doubt going to be my choice. Another possibility and option on the menu was the ‘default’ club sandwich, the responsibility for removing one of those from the kitchen was taken on by Martin my food hunting companion (purely for quality control purposes), he does good work. 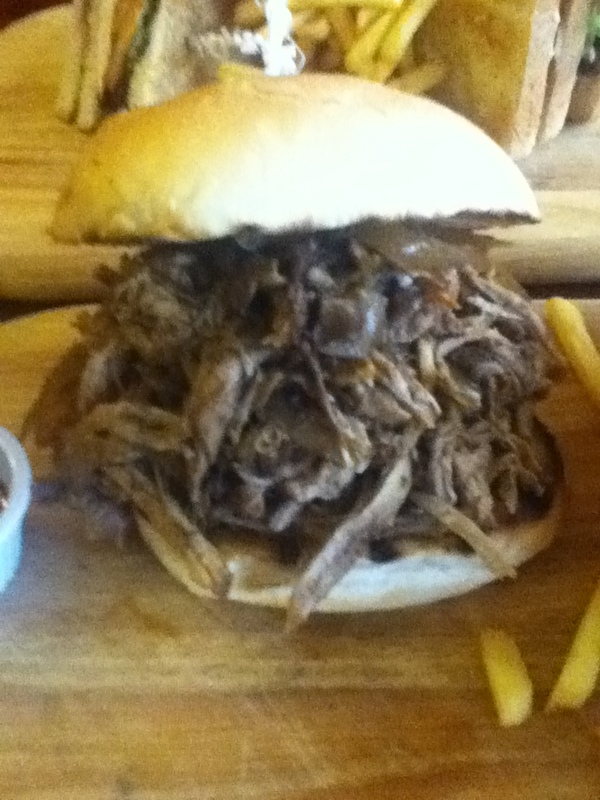 The Pulled Pork sandwich was (as I had hoped) a huge mound of meat piled between two bits of bread. In the USA Pulled Pork is often a barbeque dish slowly cooked (sometimes by smoking) until it is so tender that it just falls apart and can be torn gently into strips of juicy meat. It can also be cooked in a slow cooker or slowly cooked at low heat in the oven. I am not sure which method was used here at the Fellows but whichever it was it had the desired result. There was a tremendous flavor from the meat where the spice rub that had been applied to the meat had infused into the meat itself and into the incredibly well flavored juice covering the meat. 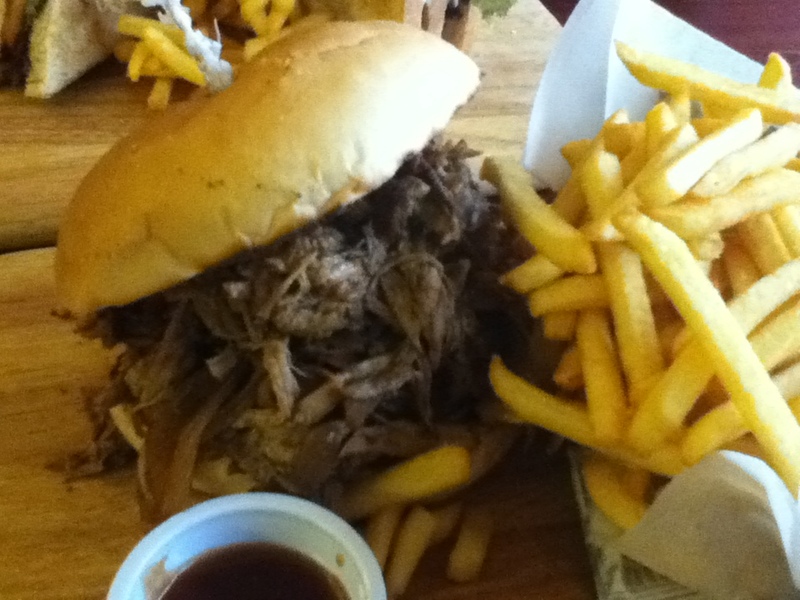 The dish came with a smoky BBQ sauce which was also decent and conspired to further elevate the flavor of the sandwich. It also had some really tender and tasty strips of soft onion with it that had been cooked in apple cider. They were really good. I was so engrossed in my Pulled Pork sandwich that I almost forgot to pay any attention to the Fellows Club Sandwich that Martin ordered. It was deemed to be a very good rendition, right up there with some of our favorite Club sandwiches in the county. 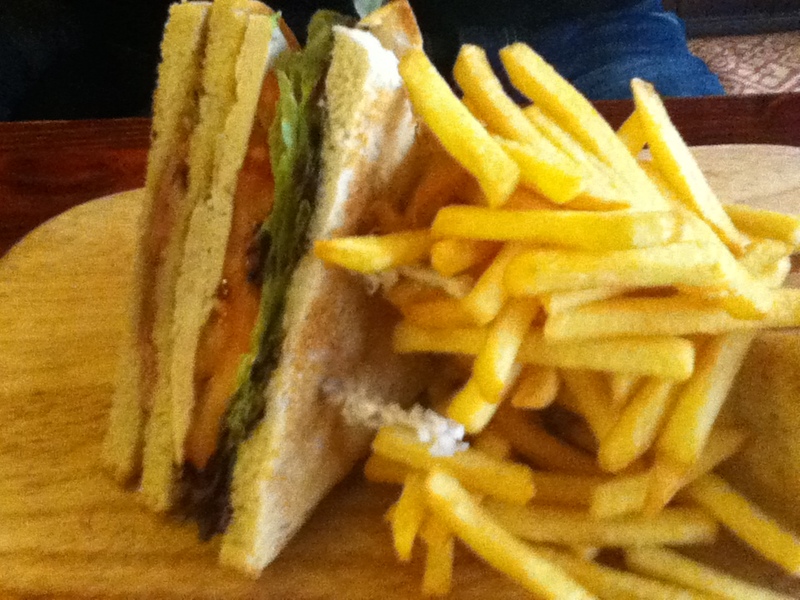 Comparision is generally drawn with the club sandwiches served at the South Bank Bar on Trent Bridge. Not necessarily because they have the best, but because there was a period some years back when we ate one there every Friday Lunchtime for about a year. But I digress. The FMC Club sandwich had good solid fillings of tender chicken breast and crispy bacon, all held together with the tomato, lettuce and mayo by some well toasted white sliced bread. It was a decent effort at what I thought was a slightly pricy £8. The only downside to both dishes were the fries which I felt were a bit ordinary and not special enough to match the sandwiches. It would have been good if it had come with the house chips which are apparently (according to the menu) “hand cut by a real person from a real potato in our kitchen“. I saw some on someone else’s plate, who was having a burger, and they looked much better than my fries. If I had known that they could have been an option then I would have asked for a substitution. I would advise you to try and get them, if you can.